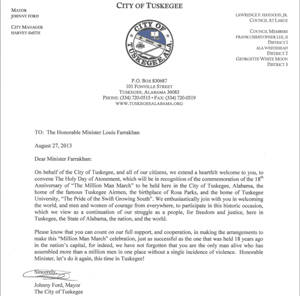 CHICAGO (FinalCall.com) - The Mayor of Tuskegee, Alabama, the Honorable Johnny Ford, extended a “heartfelt welcome” in an official letter to the Honorable Minister Louis Farrakhan and the Nation of Islam in preparation for this year’s Holy Day of Atonement and Million Man March commemoration. “Please know that you can count on our full support, and cooperation, in making the arrangements to make this ‘Million Man March’ celebration, just as successful as the one that was held 18 years ago in this nation’s capital, for indeed, we have not forgotten that you are the only man alive who has assembled more than a million men in one place without a single incidence of violence,” Mayor Ford wrote in the August 27 letter. Thousands are preparing to travel South to participate in all activities scheduled for the weekend of October 19th and 20th, including the expected launch of the next phase in the establishment of an independent, self-determined Black nation. 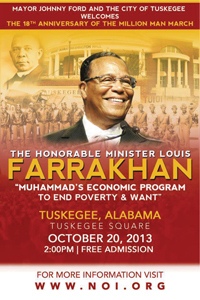 “The Minister is very excited about going to Tuskegee and we are very grateful to the Mayor of Tuskegee Johnny Ford, who has opened up the city to welcome the Nation of Islam,” said Student Minister Ishmael Muhammad, Minister Farrakhan’s assistant at the Nation of Islam’s international headquarters at Mosque Maryam. The outreach and mobilization efforts have been spearheaded by the Southern Region of the Nation of Islam led by Student Minister Abdul Sharrieff Muhammad and Student Captain Oliver Muhammad. Members of the Fruit of Islam have traveled to Tuskegee regularly over the past few weeks to deal with security, publicity and logistics as the date draws near. The opening session titled “U.O.E.N.O.” will deal with the proper education for Black students who desire to become architects of a New World. Other workshops will deal with topics such as the importance of Agriculture and Land Acquisition, helpful ways to limit or eliminate Student Loan debt and how to effectively organize a student-based movement. There will be opportunities for students to network with like-minded individuals as well as have fun during an arts and culture celebration later that evening. The highlight of the weekend will take place October 20 as all are invited to attend a free outside event to celebrate the 18th Anniversary of The Million Man March with a highly anticipated keynote address delivered by the Honorable Minister Louis Farrakhan at the famed Tuskegee Square. There are 14 historically Black colleges and universities (HBCUs) located in Alabama alone. 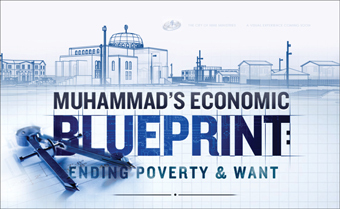 Students from HBCUs in nearby Georgia, Mississippi, and Tennessee are also expected, as well as student leaders from as far away as North Carolina and Washington D.C.
“It is critical that our students understand and know the value of the message of Minister Farrakhan particularly as it relates to the Economic Blueprint of the Honorable Elijah Muhammad and what we must do as a people regarding the acquisition of land,” said Ishmael Muhammad. “It is in the acquisition of land where our real wealth is and where our future lies,” he added.